cd vue_app npm install -D aspnet-webpack webpack-hot-middleware or yarn add aspnet-webpack webpack-hot-middleware --dev code . Since we are going to be using the ASP.NET HMR, we’re going to redirect Vue to output to wwwroot and not run its version of HMR. Now, let’s go through what we just pasted into Setup. The code below sets up ASP HMR and points to the webpack file that Vue CLI 3 generates. This last part will send all the other routes that weren’t matched by MVC to our SPA unless it starts with /api, in which case we want to throw a 404 error. We are ready to test it! Hit F5 to fire up the app. 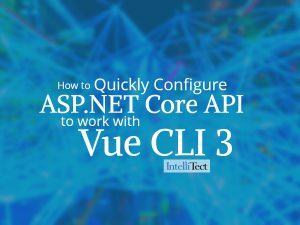 Now we can build our Vue app with an ASP.NET Core API!